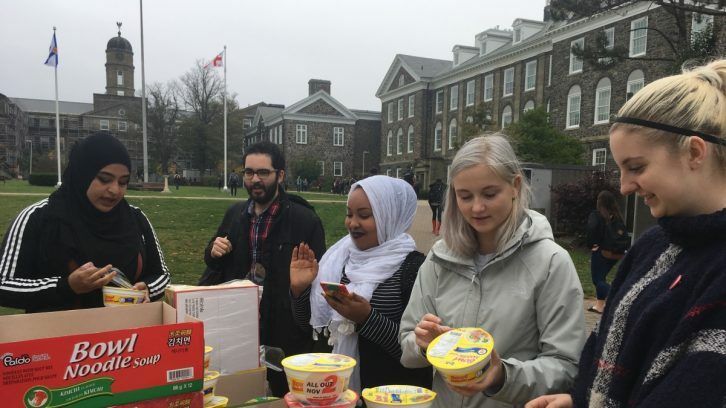 Student unions at Dalhousie University and the University of King’s College are using inexpensive ramen noodles to represent the financial struggles that many students face. 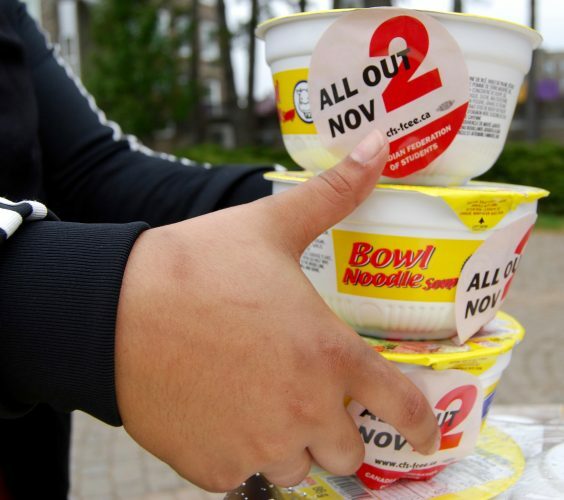 On Wednesday, representatives and volunteers from the Dalhousie and King’s student organizations distributed bowls of the noodles to students on both campuses, in an initiative called Noodles at Noon. “We’re giving away free noodles for free education, basically to get ready for the Nov. 2 day of action and to show that students have to make really tough decisions between food and textbooks, or food and high tuition fees,” says Gina Grattan, vice-president external for the King’s Student Union. The Canadian Federation of Students is calling for post-secondary students to take action and protest against rising tuition fees, through a Canada-wide event called All Out Nov. 2. On Wednesday, the packages of noodles handed out were used to encourage students to participate in the day of action. Stickers advertising the upcoming event were placed on each bowl. But Grattan says the noodles are about more than just promoting the upcoming event. Ethan Speigel, a second-year student at King’s, liked the message behind Noodles at Noon. Statistics Canada reported in September that tuition fees across Canada rose by 2.8 per cent in 2016. The average student in Nova Scotia will pay $7,218 in the 2016/2017 school year, up $382 from 2015/2016. This 5.6 per cent increase is the highest in the country.